Comedic Icons Steve Martin, Jack Black and Owen Wilson Star in the Hilarious Outdoor Adventure Coming to Blu-ray and DVD January 31! Let the fowl play begin! Twentieth Century Fox Home Entertainment presents the story of a competitive trio who quickly turn a simple quest into the ultimate competition when THE BIG YEAR spreads its wings on Blu-ray and DVD January 31. Steve Martin, Jack Black and Owen Wilson portray three men from very different walks of life, facing a mid-life crisis, a work-life crisis and a no-life crisis. In the biggest competition of their lives, they undertake an unforgettable trek through North America, engaging in hilarious and bizarre adventures and forming friendships that will last a lifetime! 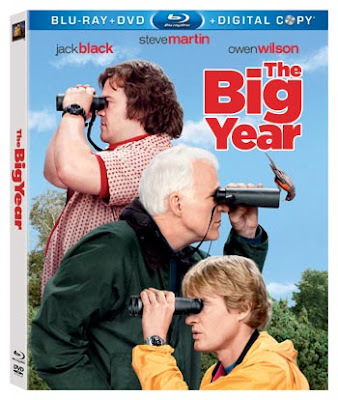 THE BIG YEAR Blu-ray is loaded with special features including the theatrical and extended editions of the film, over 40 minutes of deleted scenes and the featurette “The Big Migration.” The Blu-ray combo pack and single-disc DVD will be available for an average retail price of $29.99 and $19.99 respectively.